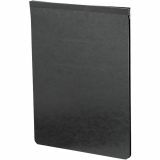 Smead Top Opening PressGuard Report Cover, Prong Fastener, 11 x 17, Black - The Smead Pressboard Binder uses a 20 point PressGuard stock to serve all heavy-duty functions. 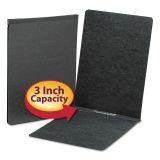 Use for reports, presentations, proposals, manuscripts and anything that requires a loose-leaf binder. 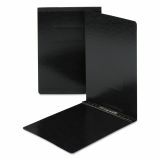 Cover is in a two-piece style to compress material, reducing bulk. Tyvek hinge and embossed leather-grain finish keep binder sturdy and professional. 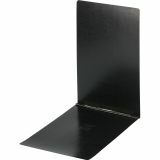 Binder is coated and resistant to moisture and stains. Metal twin-pront fasteners include compressor.  Fasteners have a 3" capacity, center-to-center.